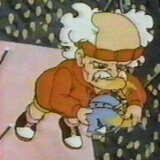 Dr. Wily, voiced by Ian James Corlett, is Dr. Right's arch-nemesis and builds Robot Masters and other devices for the evil Mother Brain. He also wheezes constantly in his speech.